The following commentary is from the EWTN series, The Papacy: A Living History, The Papal Artifacts Collection of Father Richard Kunst. Now available as a DVD, it may be purchased from EWTN. The artifact presented here is from Episode 3, Popes of the 20th Century. 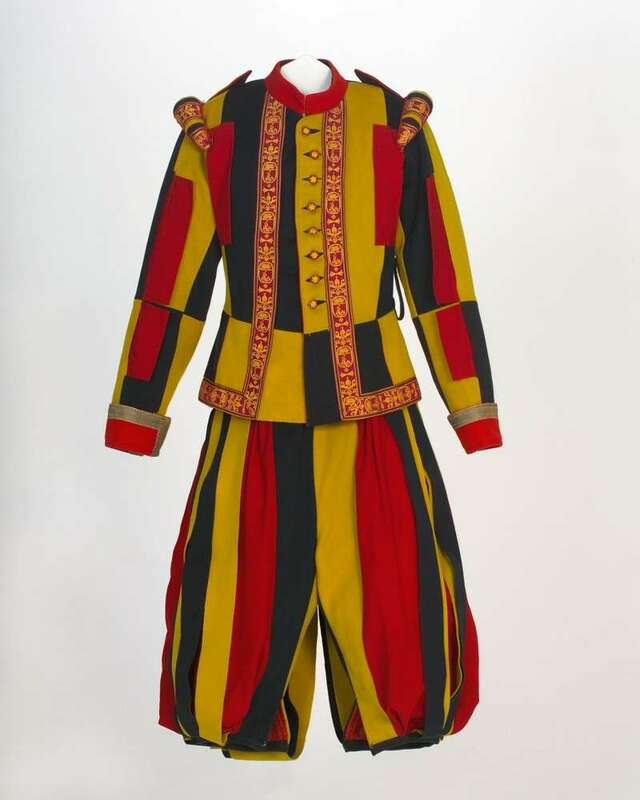 This is a Swiss Guard uniform from the papacy of Pius X. We can tell it’s from his pontificate, because up until his death, every pope would have had some aspect of the Swiss Guard uniform changed. But in 1914, when Pius X died, what they did was to go back to the original uniform from the Renaissance, from the time of Michelangelo, if you will. The original uniform of the Swiss Guard under Pope Julius II was probably that of an ordinary soldier of that era. So you can look at old pictures from the turn of the 20th century and say, “Well, that doesn’t look like a present day uniform of a Swiss Guard uniform.” It had evolved. And so we can tell that this one is from Pius X because of the piping that is on the jacket. It has his coat of arms. So the time frame of the uniforms can be distinguished by the piping on the jacket. I’ve had the opportunity to go many times to the Swiss Guard armory and to visit with some of the soldiers. In fact, some of the seminarians at the North American College in Rome, including Father’s guest host for this EWTN series, taught some of the Guard members English. There is something very unique about this particular uniform which has caused the Swiss Guard to want it. I’ll back up a bit here with some explanation. The common service time for a Swiss Guard is two years. If a man serves for five years he gets to keep the uniform. But if he keeps it, he has to sign an agreement stating that at some point it has to be returned to the Vatican, either upon his death or at some other point. As far as the Vatican is concerned, they own all Swiss Guard uniforms because of that agreement. So having visited their armory several times, I found it surprising that they don’t have too many uniforms in their archives. They have Leo XIII’s and Gregory XVI’s, if I remember correctly. But they don’t have one of Pius X. And so when they saw that I had Pius X’s, they wanted it back. The Swiss Guard first entered Rome January 22, 1506, beginning their service to Pope Julius II, who had established it. So in 2006, they had their 500th anniversary. They had a big celebration and presentation of the Swiss Guard’s history, and they asked me for mine for that presentation. We signed agreements regarding this, but in the end they didn’t use it because they refurbished one of their own from an earlier papacy. This one is in excellent condition for its age. But the fact that the Swiss Guard doesn’t have one of these, but we have it as part of this Collection, actually makes it very interesting as well. A couple of years before their anniversary, we had a huge showing of my Collection, and the Swiss Guard was very kind to give us one of the modern uniforms. So they actually allowed me to travel to Vatican City-State, and I met with them in the archives with the commandant, and I literally took the uniform in a suitcase and I brought it back to Duluth (Minnesota) for the showing of this Collection. So the agreement had been that I’d use one of theirs and they’d use mine. It is a very nice item, a very unique item from the oldest standing army in the world. It has been in place for over 500 years. Pope Julius II established them. What had happened was that Switzerland, which has almost always been a neutral country, had men who were living there who didn’t necessarily want to be neutral; they wanted to fight battles, too. And so originally they were mercenaries, basically an army for hire. So Pope Julius II, the ‘Warrior Pope’, the man who would literally go into battles in the Italian Papal States, actually hired the Swiss mercenaries to come in and support the papal army in these battles. So that’s how it started, and that is how it has continued to this very day. In order to be a Swiss Guard, you have to be Swiss, Catholic, single when you join and a certain height. You can get married afterwards but not before. Their primary role is to protect the Holy Father. We also see them standing at Vatican functions, for example, at papal Masses as honor guards. But even as an honor guard, they’re literally protecting the Holy Father. They are the equivalent to the Green Berets in the United States, functioning as the highest level of the army. And the fact is that never has a Pope died on their watch–never in over 500 years. And so we say they are a part of the living history of the papacy. In early January 2013, Papal Artifacts’ Expert, Father Richard Kunst, was hosting a tour of Rome for a small group of people and was able to arrange a tour of the Swiss Guard facility in the Vatican. Retired Major Peter Hassler, a friend of Father Kunst’s, graciously offered to conduct the tour, which would never occur in most tours of Vatican City. The you-tube presented here was given to Papal Artifacts by two members of the tour, Richard and Susan Raposa. We are grateful to them for making it available to Papal Artifacts for you to see. Major Hassler’s speech is not always as clear as we would hope, but the life of the Swiss Guard is apparent in much of his conversation and in the artifacts he so hospitably shared with all of us. Major Hassler traveled extensively with Blessed John Paul II and was actually with the Pope when he was shot on May 13th, 1981. His career with the Swiss Guard spanned a period of over thirty years. We are grateful to Major Hassler for his hospitality to us.